I tend to be careful when it comes to using extra-biblical sources in the development of my understanding of biblical doctrine. This has meant that, in the past, I have regarded all extra-biblical sources as suspect and therefore of little use to understanding theology or biblical history. I have even regarded those who embrace, for example, the Book of Enoch as outright heretics. Over the course of the past year I have been challenged on my position by men I know to be staunchly orthodox, and not at all given to the oddities I consider on the fringe of the evangelical community. 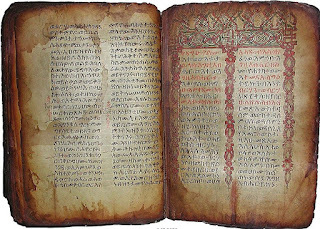 I have discovered biblical scholars such as Dr. Michael Heiser who, while not accepting the Book of Enoch as scripture, does utilize the Enochian writing in a way that fits orthodox hermeneutics. One of the basic rules of hermneutics is that we do our best to interpret a biblical text according to the plain meaning as it would have been understood by its intended readers. In the case of the New Testament, we are dealing with 1st century Jews and Gentiles. As any student of biblical studies can tell you, the way the intended audience understood any given passage could be markedly different than the modern evangelical reader. The intended audience are in a different culture, a different time, with different life experiences, and very different religious histories than most of us today. Many comments and symbols that appear in the New Testament allude to things entirely lost on the reader of the 21st century. "Rather than filter the Bible through creeds dating from the 17th and 18th centuries, or even the period of early Christianity, the Bible's actual context is the one that produced the biblical books-the era stretching from the Second millennium BC to the First century AD. All other contexts are foreign to the Bible, no matter how persuasive they are in denominational traditions. The student of the Bible must make all foreign contexts subservient to the Bible's own context.That means replacing our own worldview with that of the biblical writer living during this ancient time span in the ancient Near East and Eastern Mediterranean. The way to do that is to immerse ourselves in the intellectual output of those cultures in which the biblical Israelite and later Hellenistic Jews lived when God moved them to write scripture." Listening to Dr. Heiser's Naked Bible podcast, which takes just this hermeneutical approach, opened up an entirely different view of not just Scripture itself, but of reality in light of what Sacred Scripture actually intends to convey. This approach to exploration of the Word is one which, I feel, is both consistent with orthodoxy and revolutionary at the same time. Through it I have been able to see things not just in Scripture, but in the Ante-Nicene Fathers' writings which previously had been either difficult to understand, or required some unconvincing theological twists and turns to try to make sense of. Of course, this stems from our fear of just those resources that Dr. Heiser encourages us to explore. It was with this new-but-old approach to Scripture that I took another objective look at the Book of Enoch. What I found is a book that does indeed connect with the New Testament without a single assault on any doctrine of the Christian faith. In addition, I found that Enoch fleshed out what seem arbitrary and passing statements such as those in Genesis 6:1-4 and Daniel 14:13, 17, and 23, just to name a few examples. It also connects biblical history to the history of the various cultures to emerge since Noah's family survived the Flood. So what am I saying? I am saying that I can no longer hold the position that those who utilize resources such as the Book of Enoch are heretics simply for doing so, nor is such an approach an attack on the canon or Christian doctrine. In fact, it does the opposite. It demonstrates a depth of knowledge underneath these basic doctrines we hold true. There is much we can gain by examining such writings as the Book of Enoch, the Book of Jasher, and the Dead Sea Scrolls, to name a few. I would encourage my readers to listen to Dr. Heiser's podcasts and decide for yourself.